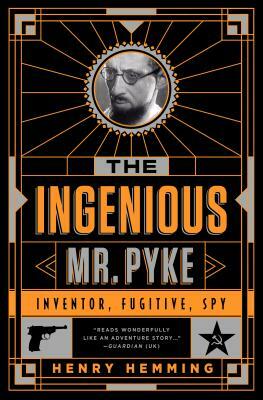 The Ingenious Mr. Pyke: Inventor, Fugitive, Spy (Paperback) | Eagle Harbor Book Co. In the World War II era, Geoffrey Pyke was described as one of the world's great mindsto rank alongside Einstein. Pyke was an inventor, adventurer, polymath, and unlikely hero of both world wars. He earned a fortune on the stock market, founded an influential pre-school, wrote a bestseller, and came up with the idea for the US and Canadian Special Forces. In 1942, he convinced Winston Churchill to build an aircraft carrier out of reinforced ice. In 2009, long after Pyke's death, MI5 released a mass of material suggesting that Pyke was in fact a senior official in the Soviet Comintern. In 1951, papers relating to Pyke were found in the flat of Cambridge Spy” Guy Burgess after his defection to Moscow. MI5 had watchers” follow Pyke through the bombed-out streets of London, his letters were opened, and listening devices picked up clues to his real identity. Convinced he was a Soviet agent codenamed Professor P, MI5 helped to bring his career to an end. Henry Hemming is the author of four previous works of nonfiction, including Misadventure in the Middle East. He has written for the Sunday Times, Daily Telegraph, Daily Mail, Times, Economist, FT Magazine, and the Washington Post, and appeared on Radio 4's Today” programme and NBC's Today” show. He lives in London with his wife and daughter.